Enlarge Pair of speaker pole terminals . Robust gold-plated version, to be screwed and plugged, for insulated use in metal housings. Enlarge Pair of speaker pole terminals . 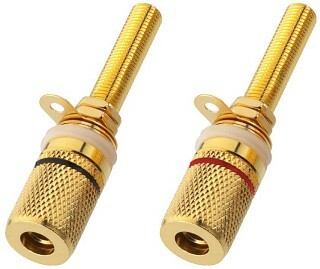 Solid gold-plated version, to be screwed and plugged, e.g. for plastic housings, uninsulated. Enlarge Pair of speaker pole terminals . Nickel-plated version, can be screwed and plugged, for wooden cabinets up to 25 mm, uninsulated. Enlarge Pair of speaker pole terminals . 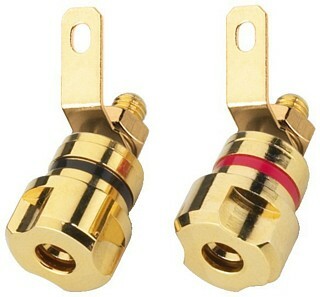 High-quality gold-plated version, can be screwed and plugged, for wooden cabinets up to 25 mm, for insulated use in metal housings. 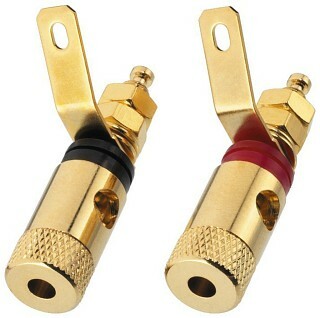 Enlarge Pair of high-end speaker pole terminals . 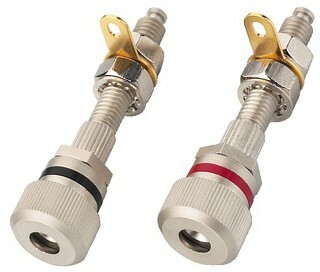 Especially solid version, can be screwed and plugged, for wooden cabinets up to 25 mm, for insulated use in metal housings. 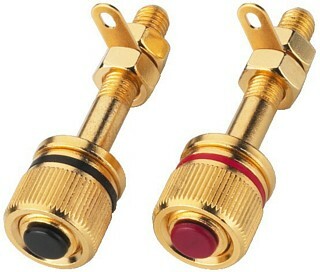 Enlarge Pair of high-end speaker pole terminals . 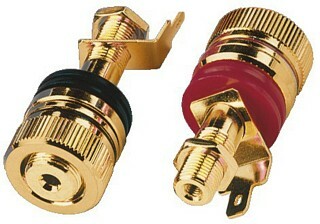 Particularly solid gold-plated version, can be screwed and plugged, for wooden cabinets up to 27 mm, uninsulated.